G.935 is a 1976 cross of Ottawa 3 and Robusta 5. Size is reported to be slightly larger than M.26, but the rootstock has resistance to fire blight and crown rot. It is not resistant to woolly apple aphid. Production efficiency is rated equal to M.9. 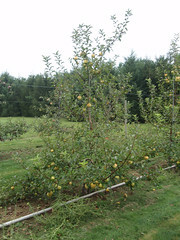 In the Golden Delicious trial at Rock Springs in 2006, tree size was about 9 percent larger than M.9 and 12 percent smaller than M.26. Production efficiency was not significantly different although slightly higher than M.9 in 2005. The rootstock seems to induce wider angled branching in the scion.